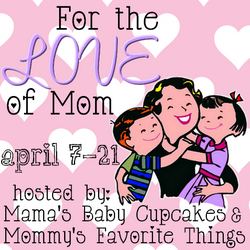 Welcome to the “For the Love of Mom” Giveaway Hop hosted by Mama’s Baby Cupcakes & Mommy’s Favorite Things. The theme of this event is great gifts for mother’s, and each blog participating has a prize valued at $25+. This hop is April 7-21 and your winnings arrive just in time for Mother’s Day! Also be sure to enter the Grand Prize valued at $160. For my giveaway you could win a doTerra essential oils introductory kit sponsored by Whole Wellness Coach. This set contains a pamphlet, DVD, and three oils: peppermint, lemon, and lavender. Essential oils are wonderful for aromatherapy, cleaning, relaxation, and many people feel that they can help aid in healing of common ailments such as headaches, depression, anxiety, insomnia, and more. After you’ve entered my giveaway don’t forget to enter the grand prize and check out the linky for more awesome prizes. Be sure to stop by Mama’s Baby Cupcakes because she’s also hosting the Grand Prize for this hop. Retail value is $160 and features the sponsors of Zoey’s Attic, Madil flip flops, Pretty Please Polish, The Diaper Clutch, and Pure Romance by Stacy. A great package for anyone, but a special gift for the special Mom in your life!